WESTERVILLE, OH, Feb. 5, 2019 — The Kroger Co. (NYSE: KR), announced today the launch of the Zero Hunger | Zero Waste Innovation Fund and its first open call to support the company’s bold and ambitious plan designed to end hunger in its communities and eliminate waste across the company by 2025. Kroger invites eligible innovators to submit a letter of intent, starting today through March 4, 2019, for ideas and solutions to prevent food waste. Kroger’s Zero Hunger | Zero Waste Innovation Fund is a signature program of The Kroger Co. Zero Hunger | Zero Waste Foundation, a new public charity designed to catalyze collective action and direct resources where they are needed most to help transform Kroger communities. For the inaugural open call, Kroger will award grants ranging from $25,000 to $250,000 per project, prioritizing emerging technologies and ideas focused on food waste prevention. Proposals will be evaluated by the board of directors for The Kroger Co. Zero Hunger | Zero Waste Foundation, as well as an advisory council of leaders from World Wildlife Fund, Feeding America, ReFED, Kroger Technology, and 84.51°. Criteria includes alignment with Kroger’s Zero Hunger | Zero Waste plan, potential for positive impact in U.S. communities served by the Kroger Family of Companies, ease of implementation, geography, and measurability and scalability. Applicants must submit letters of intent by March 4, 2019 to receive a chance to be selected as finalists and provide full applications for grant consideration. Grant recipients will be announced in the spring, and grantees will receive access to Kroger leaders and partners; the potential to test their solution with the Kroger Family of Companies or a partner; networking opportunities with program peers, industry experts and investors; visibility through case studies, showcases and promotional content; and the option to apply for follow-on funding. “We are excited to launch our new Zero Hunger | Zero Waste Foundation and first Innovation Fund open call dedicated to identifying food waste solutions that can disrupt and help Kroger fulfill our vision of serving America through food inspiration and uplift,” continued Adelman. 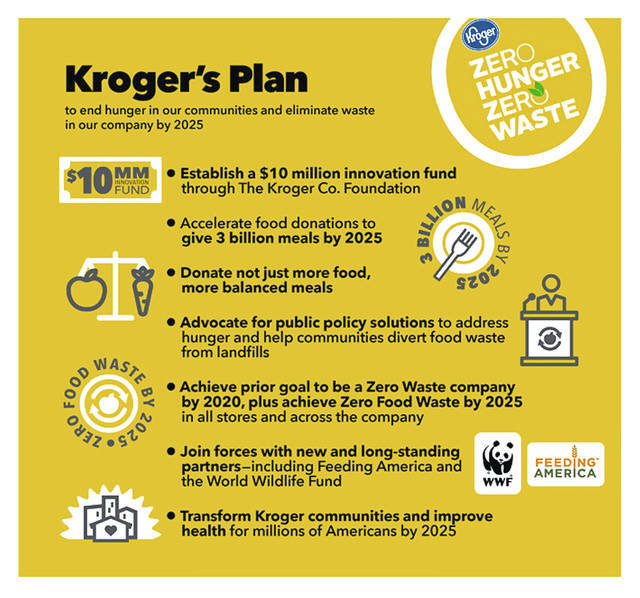 Kroger introduced its Zero Hunger | Zero Waste commitment in September 2017, pledging $10 million to support new ideas and concepts. To learn more about the inaugural call and how to apply, visit https://innovationfund.kroger.com and follow the journey at #ZeroHungerZeroWaste. At The Kroger Co. (NYSE: KR), we are dedicated to our Purpose: to Feed the Human Spirit™. We are nearly half a million associates who serve over nine million customers daily through a seamless digital shopping experience and 2,800 retail food stores under a variety of banner names, serving America through food inspiration and uplift, and creating #ZeroHungerZeroWaste communities by 2025.